Unlatch the fan module door. Pull the release tabs back to release the door. Press the top cover release button and slide the top cover to the rear about a 0.5 inch (12.7 mm). 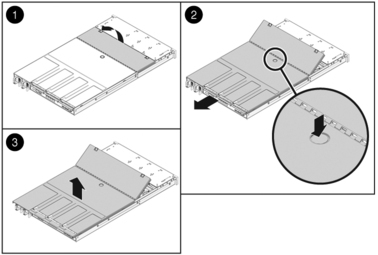 The following figure shows the release button in a Sun SPARC Enterprise T5120 server. The top cover release button in a Sun SPARC Enterprise T5220 server is similar. Note - In newer versions of the top cover, the release button is located closer to the edge of the cover. Except for this difference in location, the release mechanism operates in the same manner in both versions.